The Lady Tigers’ tennis team took a big step toward a potential conference championship Thursday, with a 6-3 home win over Joplin. Republic swept the three doubles matches to grab an early lead, then split the six singles matches to hold on. 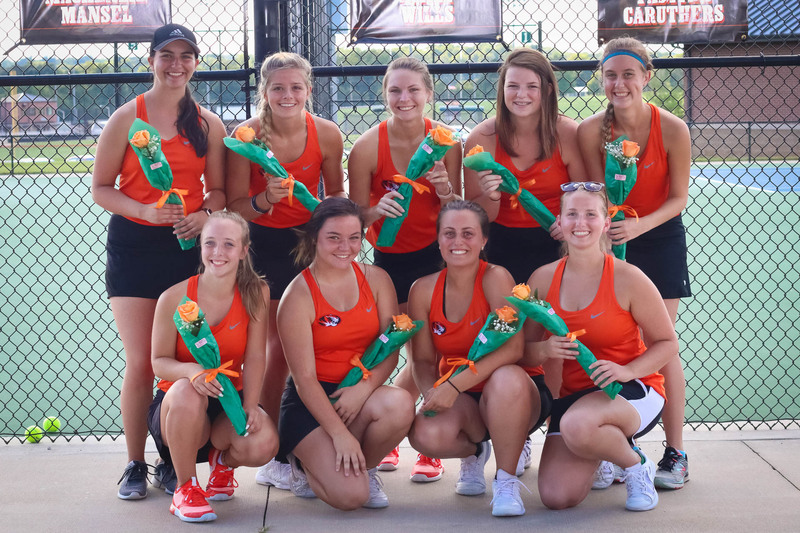 Before the match, head coach Dan Vales and the tennis program honored nine seniors who’ve seen the program grow, moving from its previous home at the tennis courts at J.R. Martin Park to its current home on the high school campus. The nine seniors are Kaitlyn Snyder, Jordyn Gianopulos, Isabella Freeman, Destini Brooks, Tabitha Caruthers, MacKenzie Mansel, Bethany Overturf, Taylor Sanders, and Emily Wills. In all three of the doubles victories, Republic trailed at one point. The most dramatic comeback belonged to Carly McAtee and Hannah Morgan, who trailed 6-2, then won seven of the next eight games to grab a 9-7 victory. The other doubles matches were also close, with Kaitlyn Snyder and Jordan Gianopulos winning 8-6, and Katie Stiles and Isabella Freeman winning by the same score. Snyder cruised to a singles win, 8-2. Morgan and Freeman also won their singles matches handily, 8-1 for Morgan and 8-2 for Freeman. The Republic JV won 11-7. The Lady Tigers improve to 8-0 overall. They’re 7-0 in the Central Ozark Conference, with three matches remaining.